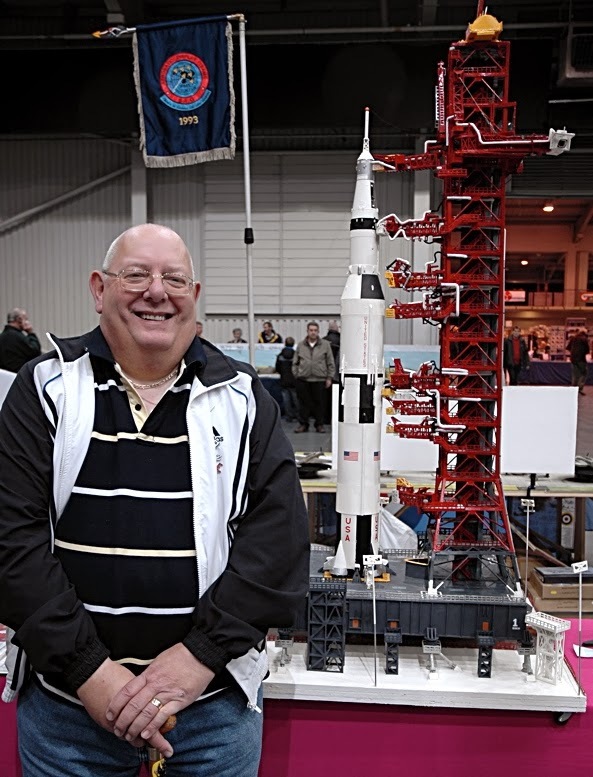 At first glance, the giant 1:96 scale Saturn V launch complex built by John Ashton (above) looks as if it could be built from modern materials. 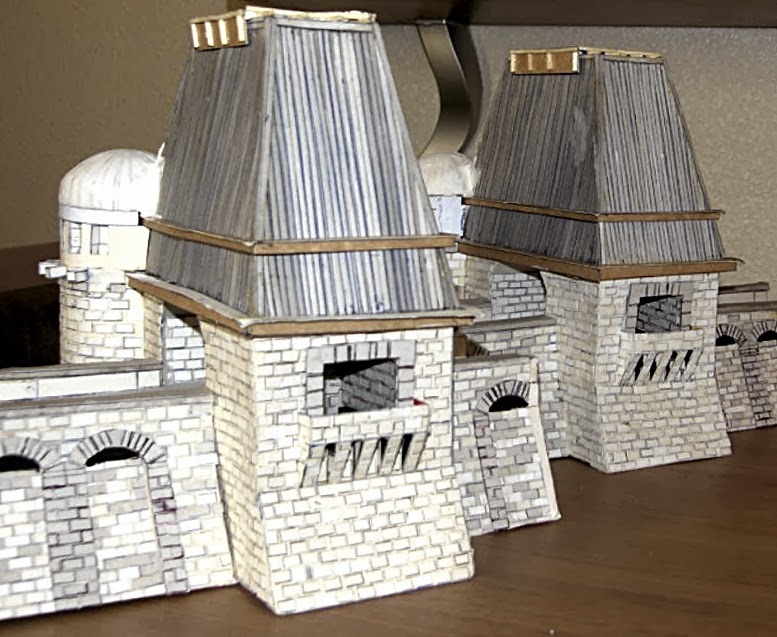 But no, take a closer look, and you realise the construction is from an older period, the builder being someone who seems to like a lot of cornflakes, for he makes his models mostly out of cereal boxes. 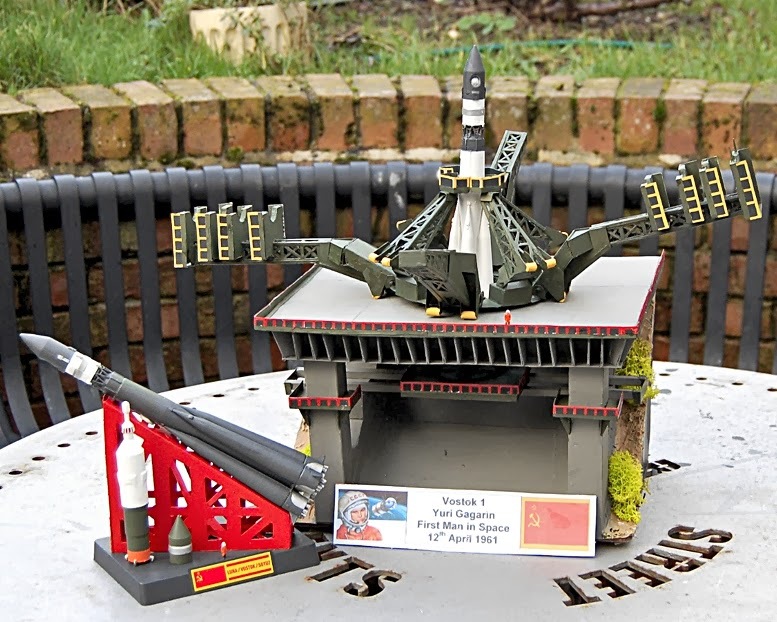 Mat Irvine reports: John Ashton entered his Saturn V launch complex into the 2010 IPMS Scale ModelWorld ‘factual space’ section, and although his work didn’t win gold, it did take a bronze. 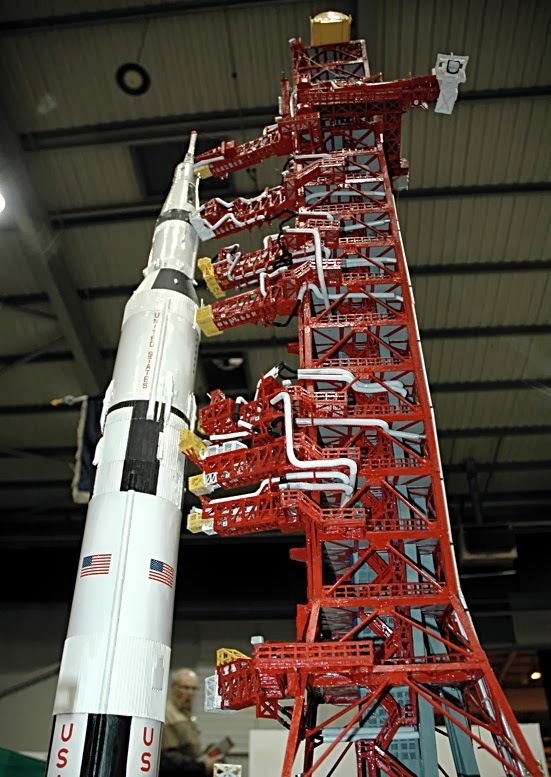 The sheer size of the model demanded attention, and although when you look closely you can see the source materials, from a couple of metres away, the whole thing takes on a very realistic look. 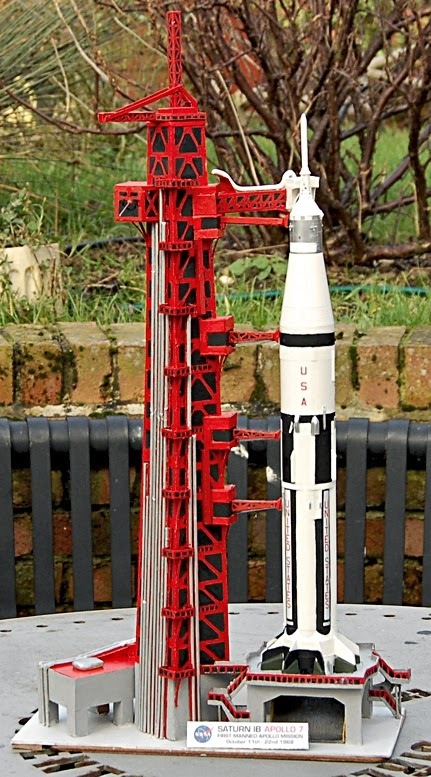 The Saturn rocket is assembled from a 1:96 scale Revell kit, but the launch complex is constructed from found materials, mainly card from cereal boxes. Although John builds mostly from cereal boxes, he also uses other ‘found’ materials, such as florist’s wire, wooden dowel, and drinking straws. When you start to get closer, you can spot the materials. 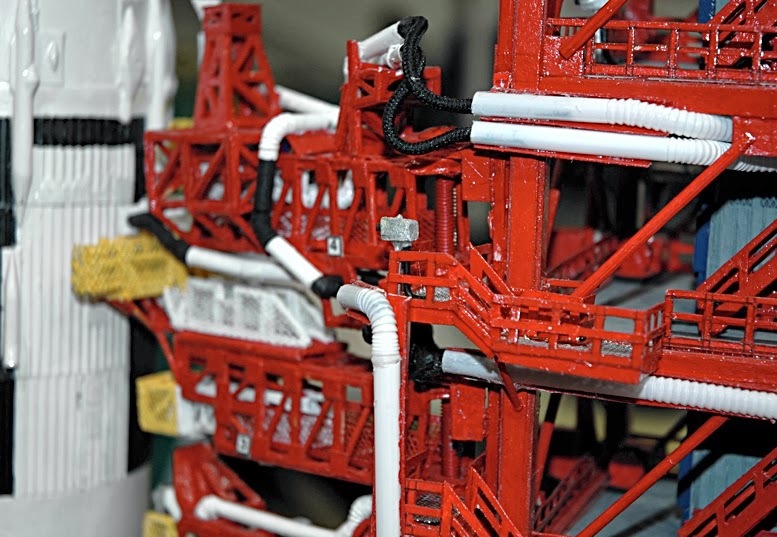 The use of bendy drinking straws for piping is ingenious, and note the photo of the real Apollo crew at the end of the swing arm. Photographed looking up against a suitable sky backing, you’d be hard pressed to say this isn’t the real thing. 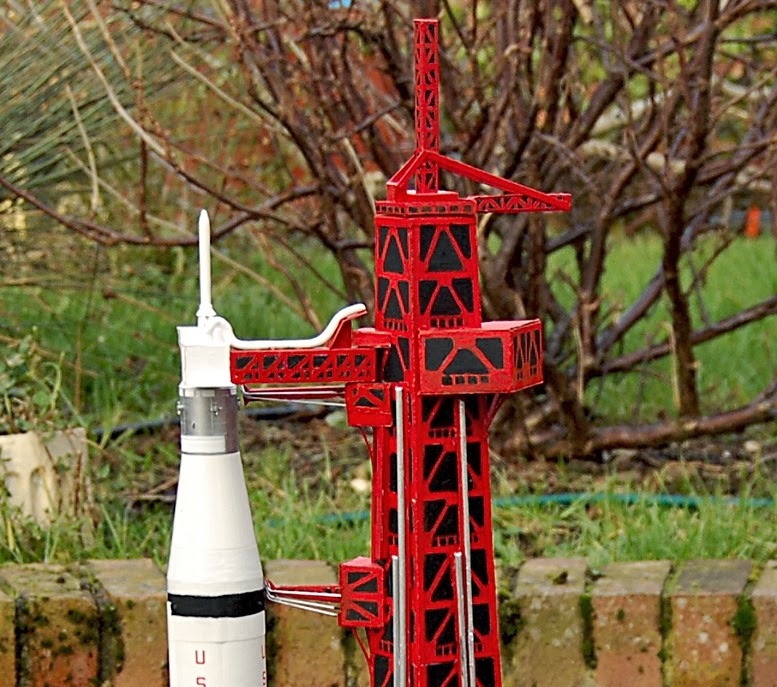 John has also done a similar build to represent the Apollo 7 mission (below) to a smaller 1:144 scale. 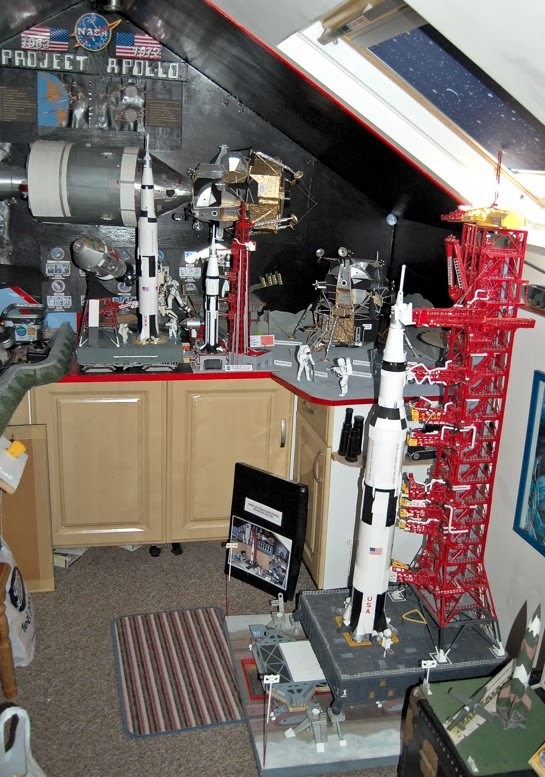 Space models on display in John’s ‘man cave’ (below, every home should have one!) 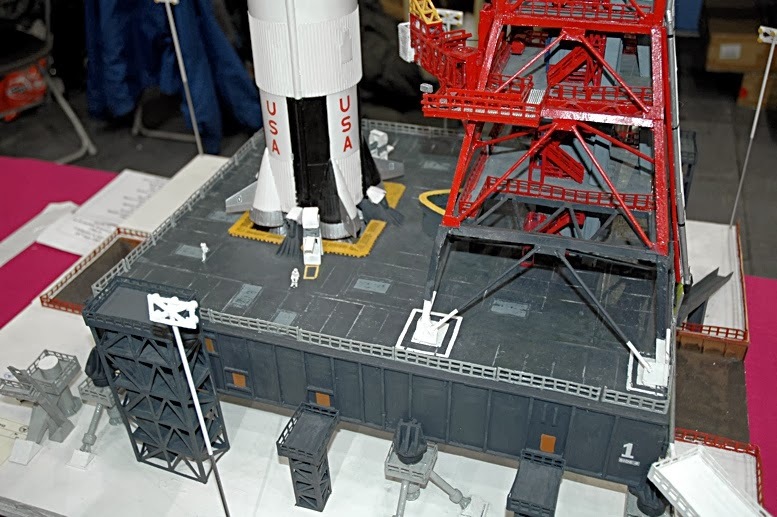 Note the giant Apollo Command Module linked to a Lunar Module at the back - this duo is big, likely to 1:16 scale. I may take a closer look at this pair of model spacecraft in future. So space is big with John Ashton, but that’s not all. 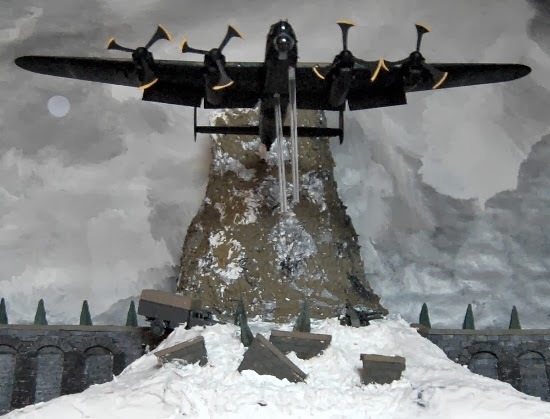 Recently, John turned his attention to an older historical event (below), the bombing of the Ruhr Valley dams by the famous Royal Air Force 617 ‘Dambusters’ Squadron, in 1943. Only the Lancaster aircraft was built from a kit, the 1:72 scale new-tool Airfix kit release. The rest of the display - towers, dam structure, plume of water - are all made of cardboard. Building the Mohne dam required each brick to be separately cut from card, then glued into position. 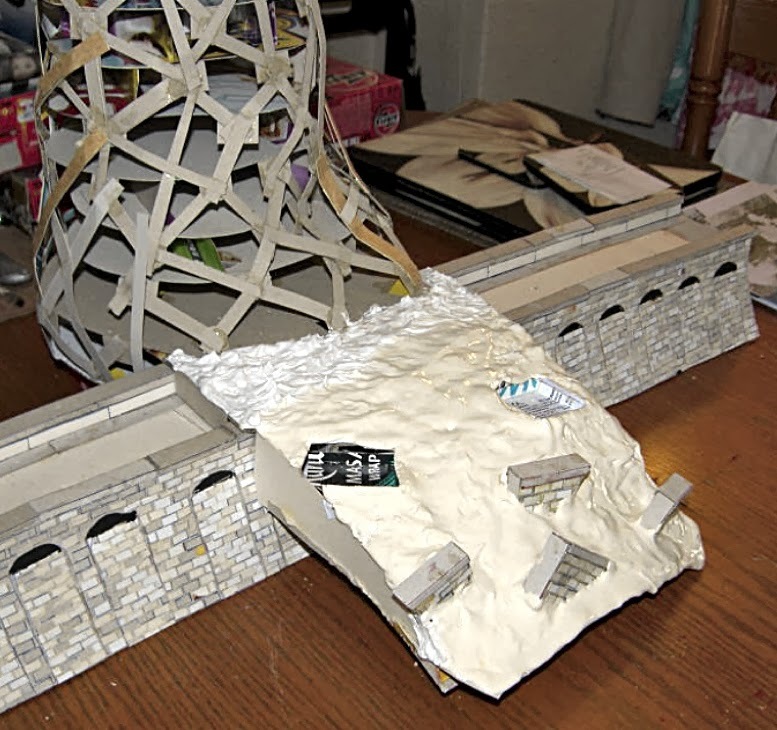 The finished dam model (below) before being photographed ‘in situ’. 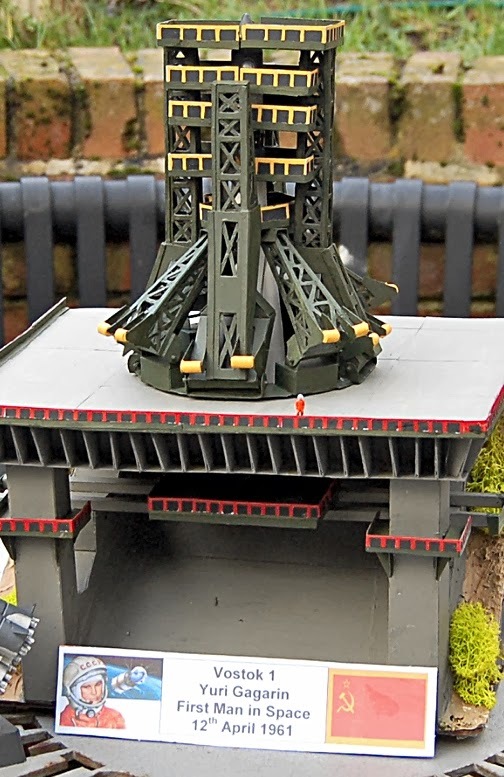 It’s 1400 mm long (55 in), with towers that stand 254 mm (10 in) tall. Building the section of breached dam (below) with plume of water from an exploding bomb. 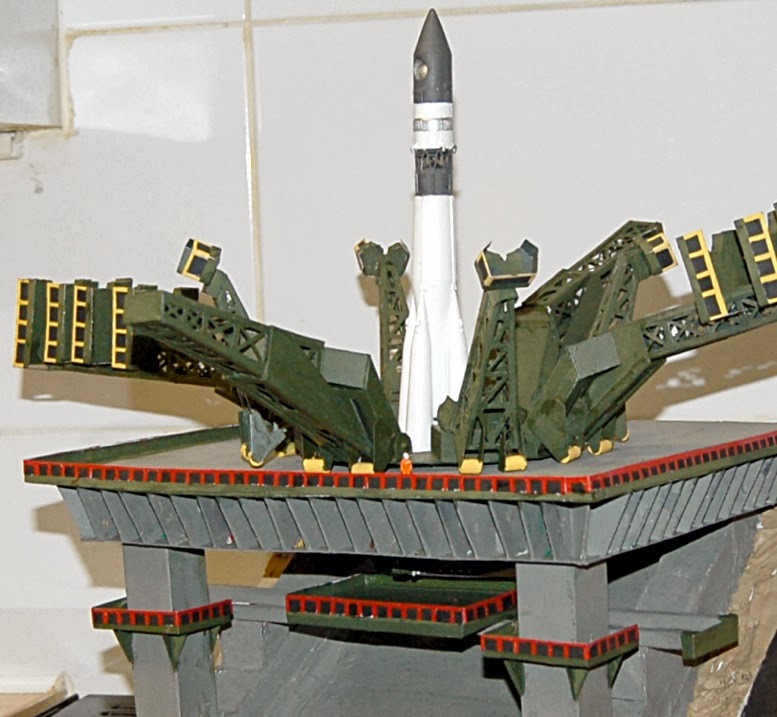 Another of John’s creations, this time the Vostok launch complex (below). 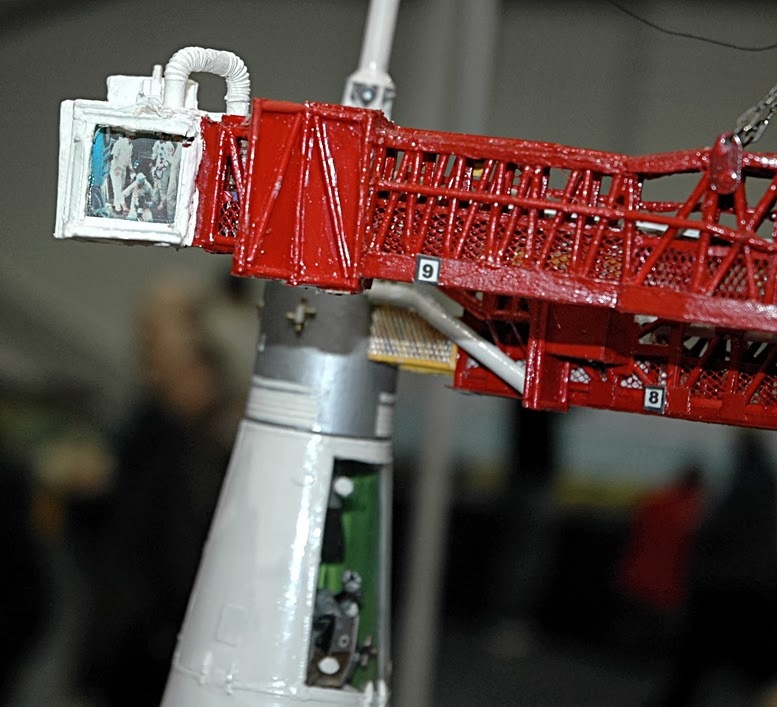 This used the Airfix Vostok launcher, so is made to 1:144 scale. Note that the four launch-tower structures swing back.